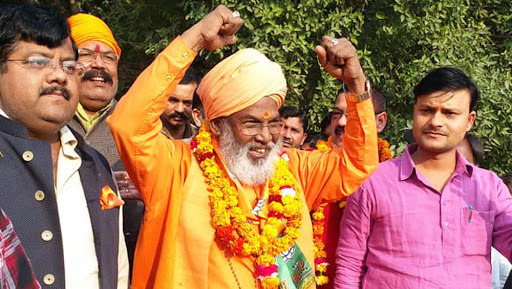 New Delhi, April 12: Following the footsteps of Union Minister Meneka Gandhi, another Bharatiya Janata Party candidate Sakshi Maharaj on Friday sparked a controversy that those who won't vote for him in the Lok Sabha Elections 2019 election will attract 'bad karma'. The statement of the sitting MP is quite similar to Meneka Gandhi who had said that 'she won't work for the Muslims in Uttar Pradesh's Sultanpur if they don't vote for her in the upcoming polls'. Addressing an election meeting, Maharaj had said, "When an ascetic comes at your door, seeking alms, pleading, and if his pleas are not heeded to, he might walk away with your good karma and handover his bad karma." Maneka Gandhi Stirs Controversy, Says, 'Won't Help Muslims If They Don't Vote for Us'; Watch Video. Adding on, he said, "Main ek bhikshu hun. Agar aap chahoge to main jeet jaunga. agar aap jitana nahi chahte to mandir me bhajan aur kirtan karenge, lekin mein yahan aapke voton ki talash me hun. Mai ek sanyasi hun aur aapke darwaze par bhikh maangne aaya hun. Agar aap sanyasi to mana karte hai to aap shapit ho jayenge (I am a beggar. If you want then I will win. If you don't want me to win, then you would sing devotional songs in temples, I am in search for your votes. I am a sanyasi (saint) and have come to your door to seek votes. If you deny votes to a saint, I will give Bad Karma)." Known for making controversial comments, the sitting BJP parliamentarian from Unnao was given the ticket again by BJP this time from the same seat. Earlier in a leaked letter, he had written, as NDTV quotes, "But, if the party takes any other decision pertaining to me, then there is every possibility that the people of the state will feel hurt and the result may not be good." In 2017, Maharaj had demanded in Unnao that Delhi's iconic Jama Masjid be demolished as, claiming it was constructed on the ruins of a Hindu temple. He had said, "The first statement I made in Mathura after entering politics was: Let Ayodhya, Mathura and Kashi be and demolish Delhi's Jama Masjid. If you don't find Hindu idols beneath its staircase, you are welcome to hang me."